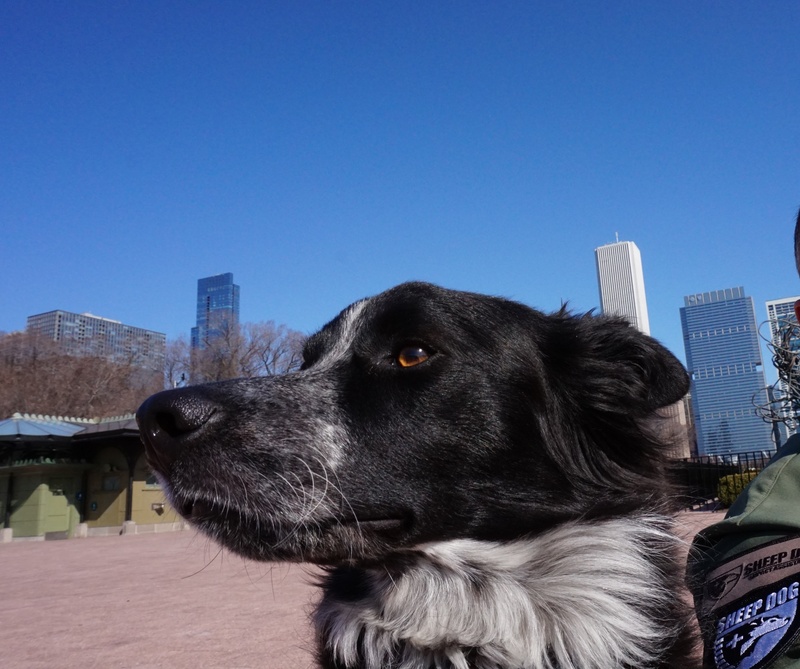 The warm sun on my black fur, the smells of the city, a stroll through Grant Park…life is good. Why can’t they drive in their own car? Mmmmmmph. I have just been informed by My Dad that I may be a bit cramped in the Scion xB this morning. Seems My Dad, the wizard that he is, has volunteered to transport his sister, his niece, and his daughter to downtown Chicago…something about a half-marathon embarking from Diversey harbor. What!? There is a long walk involved? With me? Whew, for a moment I became concerned that, perhaps, the world stopped revolving around me and making me, The Magic Man, happy and mentally stimulated. OK, I’m IN! 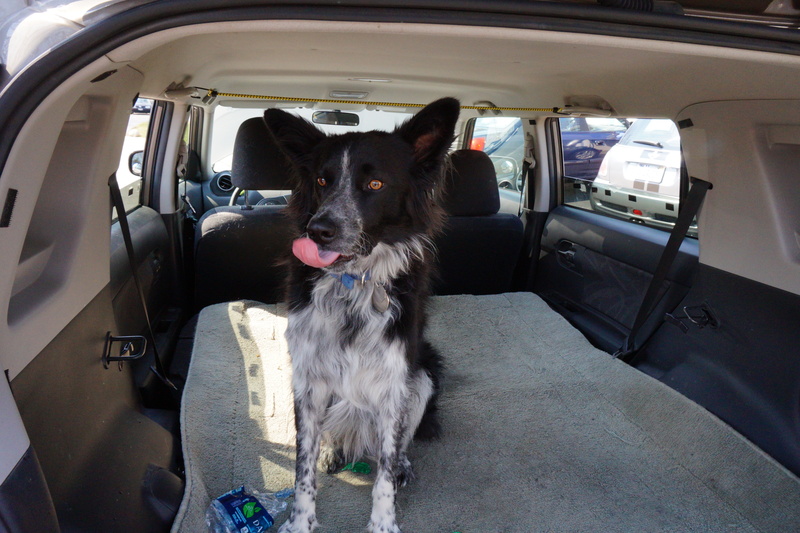 And the area behind the rear seat does have ample room to accommodate a slender Border collie…temporarily…but I would rather have my head out the window enjoying the smells of the city. OK, this calls for some sacrifice, but an adventure awaits! Do I look like a happy Border collie? 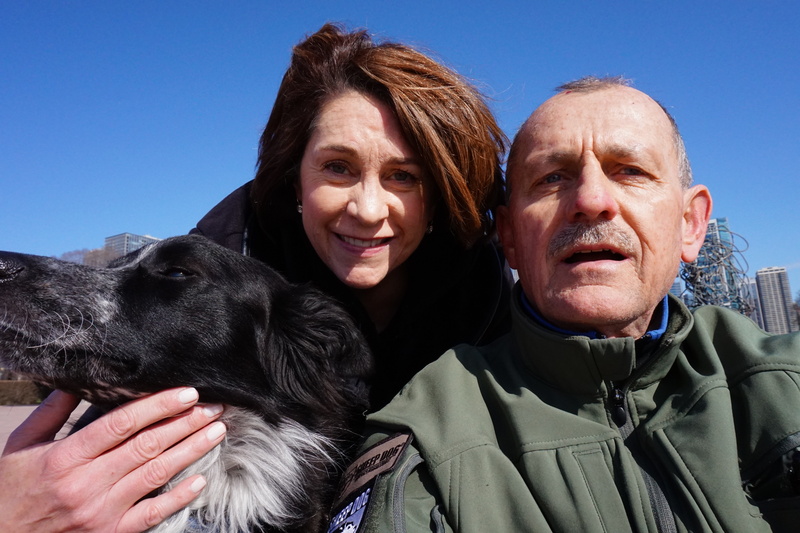 With My Dad and his sister, Mary, in Grant Park. 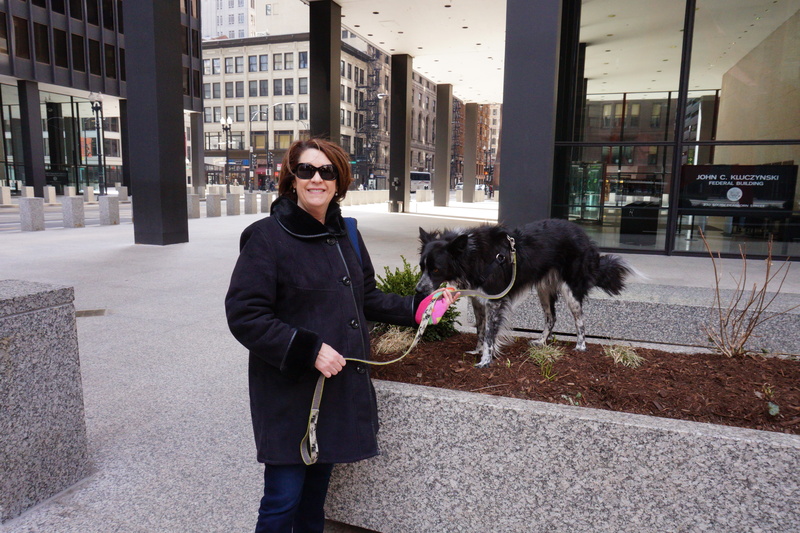 We walked by Federal Building twice. They had these very nice planters with boxwood shrubs, and I found it extremely easy to lauch myself up into the planters to leave messages on the boxwoods. It was another cramped ride on the way home. I couldn’t stick my head out the window. Suddenly, I was a part of the conversation. 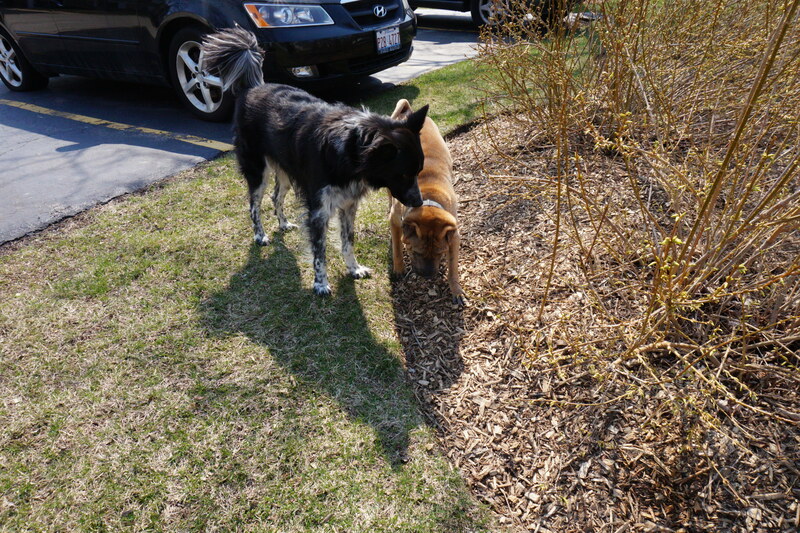 Shar Pei trying to out-maneuver the Border collie…ain’t happening, dude! A deke left, a deke right, and color me gone. Bob could not keep up with me…I ran a tight circuit, checked my “six” every couple of seconds…I would let Bob close to within inches of me then push the afterburners FULL forward. After five minutes, Bob was running out of gas. He made some more attempts to run at me with his mouth open…I didn’t see any teeth…and with a half step to the left or right, I always placed Bob a little out of position. 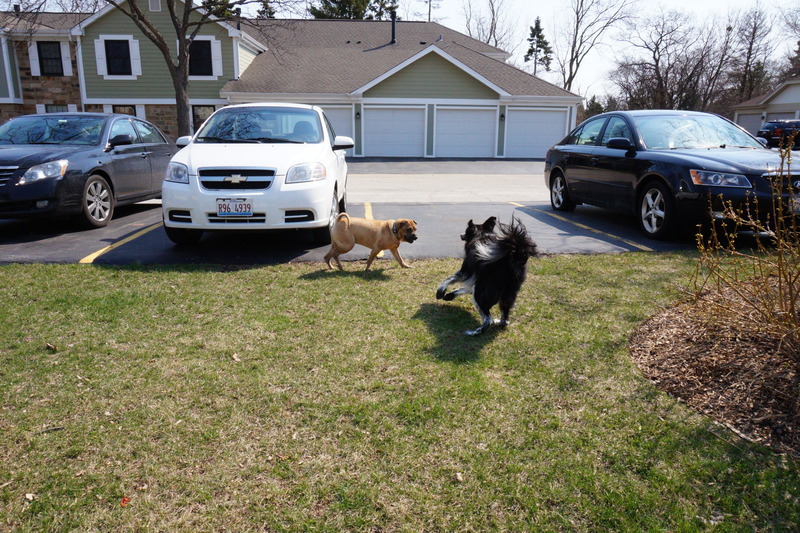 I am all about fun, so when Bob had to take a “mark” break, I moved in for some push-and-sniff action on his back and ears…I even told him, “Hey, Bob, I just want to play, I won’t hurt you.” And he settled down…within minutes, we were buddies, just hangin’ out together. Bob’s Mom, Mary, was VERY surprised that we became friends so quickly! 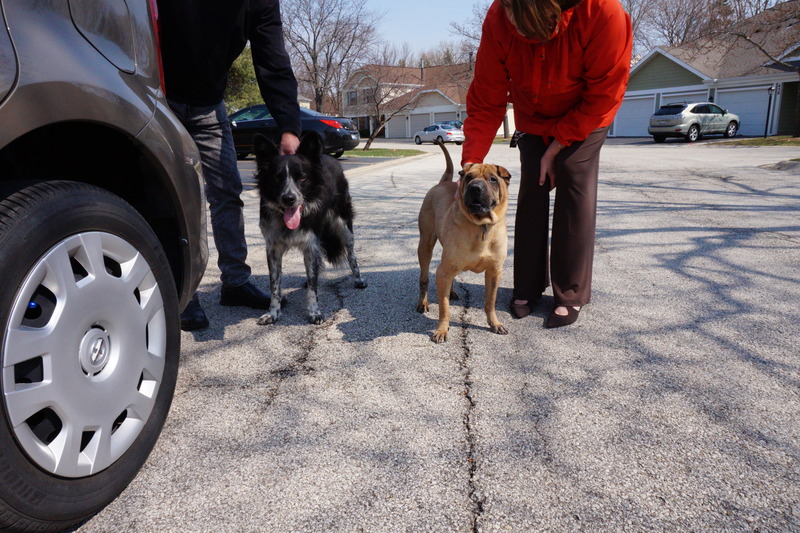 Some “push-and-sniff” action showed Bob that I was a friend, that I did not want to hurt him. 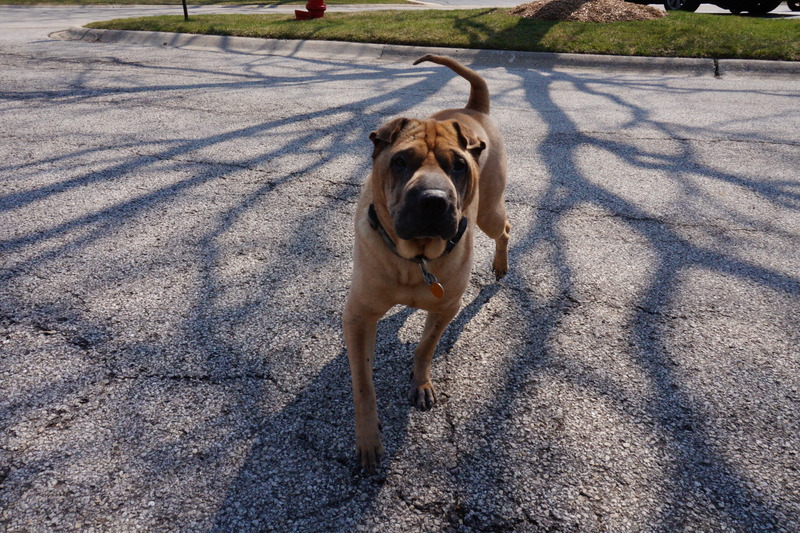 Shar-Pei’s have a tough-guy persona, but a man’s got to know his limitations. My Dad always carries a bottle of water in the Scion xB…always refreshing after a “chase-me, chase-you” session! 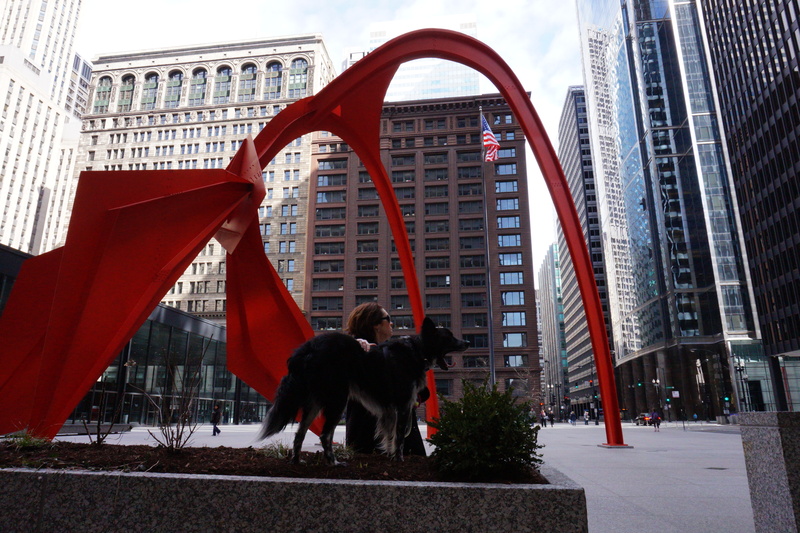 This entry was tagged border collie, border collie rescue, Chicago, dog behavior, dog rescue, dogs and people, herding dogs, life with a dog. Bookmark the permalink. Magic: What fun to see you interacting with Bob! You guys are going to be great buddies. I’m thinking we need too work on Harmony next!